Topic: "Resolutions kept or not kept"
1. Acros must be proper words (don't combine words please). 2. 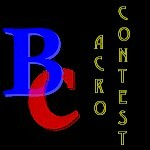 Acros MUST fit the Topic and the Word specified as the "Current Acro" on the entry form.